Acoma has been translated into English as both the "people of the white rock" as well as "a place always prepared." The Acoma are descended from Anasazi and earlier Mogollon cultures, and their pueblo has been continuously inhabited since the thirteenth-century. The primary community of the pueblo, Haaku, has existed on top of a sandstone monolith since at least 1200 CE, and is surrounded by a valley which the Acoma have farmed successfully for almost 1,000 years. Because of the pueblo's prime location, the Acoma were subject to periodic raids from neighboring Utes and Navajos and have also been subjected to Spanish, Catholic, and Anglo-European influences since the 16th century. Today, the Acoma are actively involved in the preservation of their culture in an approach that includes the Acoma Language Retention Project, as well as the conception that they are on an ongoing journey that demands engagement with the changing world around them. 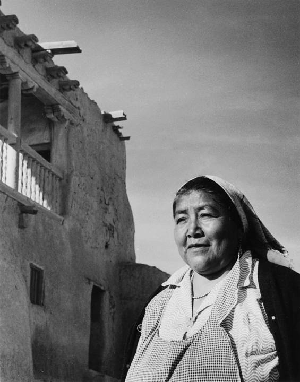 "Maria at Acoma Church, Acoma Pueblo, New Mexico, 1958," photograph, (152013). Palace of the Governors Photo Archive, New Mexico History Museum, Santa Fe. All rights reserved. Use with permission only. 2015 The Origin Myth of Acoma Pueblo. New York City: Penguin Books. (Keresan) Pueblo Indians: A Study in Acculturation and Social Control. Ph.D.
77th Congress, no. 437. Washington: U.S. G.P.O..
1973 The Acoma Indians. Glorieta: Rio Grande Press.